Bodifine takes you on a path of discovery with beautiful and exciting body jewellery designs. This cartilage set, created in stainless steel and rose gold plated, features stunning cubic zirconia stones. 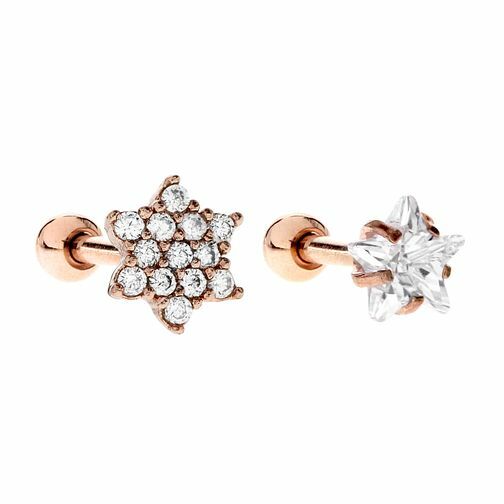 Bodifine Cubic Zirconia Rose Gold Plated Cartilage Set is rated 4.5 out of 5 by 2. Rated 5 out of 5 by Anonymous from Has amazing offers I was able to get a high quality necklace for at a real good price. Rated 4 out of 5 by Anonymous from Pretty Really pretty earrings, the posts are quite thick but i could still get it into my piercing without too much trouble, the larger star is a bit big for my ear but the little one is just right and looks lovely.